This year’s UNmissable event. 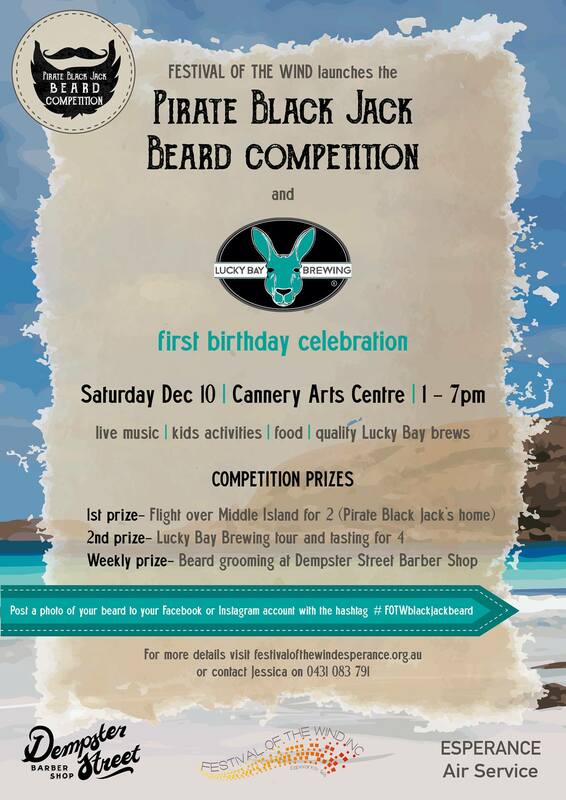 Festival Of The Wind proudly launches its ‘Pirate Black Jack Beard Competition’ with Lucky Bay Brewing’s one year anniversary celebration. Join us for live music, kids activities, food, weird and fantastical beards, quality Lucky Bay brews, beard transformation demos by Dempster Street Barber Shop and most importantly the chance to win INCREDIBLE PRIZES!!!! WEEKLY PRIZE – beard grooming appointment at Esperance’s trendy new Dempster Street Barber Shop. A chance to give your beard the professional attention it deserves. 2nd PRIZE – tasting and brewery tour for 4 people at Lucky Bay Brewery here in Esperance.